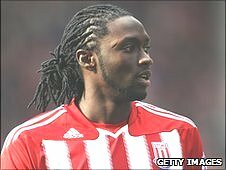 Stoke striker Kenwyne Jones believes luck deserted him in front of goal before netting for the first time in three months at Tottenham on Saturday. "At the beginning of the season, no matter what I hit, it was going in," the £8m striker told BBC Radio Stoke. "Then you go into a period where you have the same half-chances, that you think might go in, not going for you." Jones scored for the first time since 1 January but could not prevent the Potters losing 3-2 at White Hart Lane. "My performances have been picking up over the last six weeks or so and I think it's the pinnacle of that," added the Trinidad and Tobago international. Jones scored four times in his first six matches for the Potters after his record move from Sunderland in August, but has found goals harder to come by since the opening weeks of the season. All five goals on Saturday came in an enthralling first half, although manager Tony Pulis was unhappy with the way Spurs were allowed to take control of the game. "We gifted them three very, very poor goals," Pulis told BBC Radio Stoke. "Sometimes we come to these grounds and we stand off people. "That was certainly the case with one or two of our players in the first 25 minutes. "We just stood off and watched them play around us, which is just not good enough. "I thought we did better in the second half and we were always a threat." Stoke, who are 12th in the Premier League on 38 points, can now turn their attentions to the FA Cup semi-final against Bolton at Wembley on 17 April. Jones continued: "It's the first [semi-final] in 39 years for the club and the first time for me so I'm looking forward to that. "It's about the game more than the occasion. "We're not worried about Bolton, all we're going to do is focus on our game plan and I'm sure Bolton will do the same."